Omani Sultan Qaboos bin Said, left, and Israeli Prime Minister Benjamin Netanyahu in Muscat, Oman, Oct. 26, 2018 (Israeli Prime Minister’s Office photo via AP Images). 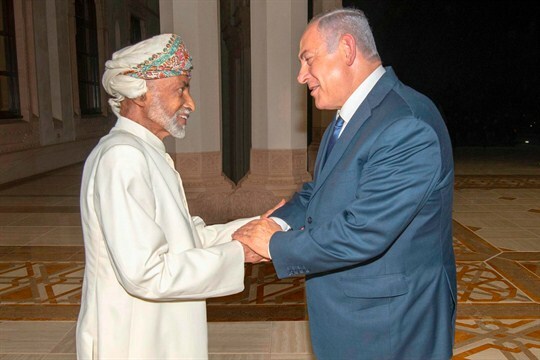 Israeli Prime Minister Benjamin Netanyahu paid a surprise visit to Oman in October, the first official visit by an Israeli leader in over two decades. Palestinian President Mahmoud Abbas also traveled to Oman days before Netanyahu’s trip, leading to speculation that Oman could be acting as a go-between for another round of Israeli-Palestinian peace talks. In an interview with WPR, Giorgio Cafiero, founder and CEO of Gulf State Analytics, a geopolitical risk consultancy, discusses this recent flurry of diplomatic activity in the context of Oman’s historical efforts to break impasses in a number of regional conflicts.